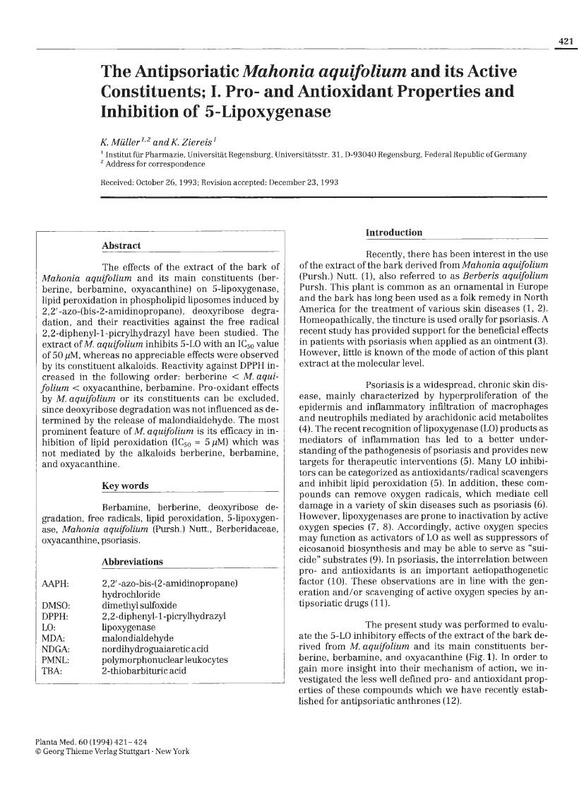 The effects of the extract of the bark of Mahonia aquifolium and its main constituents (berberine, berbamine, oxyacanthine) on 5-lipoxygenase, lipid peroxidation in phospholipid liposomes induced by 2,2′-azo-(bis-2-amidinopropane), deoxyribose degradation, and their reactivities against the free radical 2,2-diphenyl-1-picrylhydrazyl have been studied. The extract of M. aquifolium inhibits 5-LO with an IC50 value of 50 µM, whereas no appreciable effects were observed by its constituent alkaloids. Reactivity against DPPH increased in the following order: berberine < M. aquifolium < oxyacanthine, berbamine. Pro-oxidant effects by M. aquifolium or its constituents can be excluded, since deoxyribose degradation was not influenced as determined by the release of malondialdehyde. The most prominent feature of M. aquifolium is its efficacy in inhibition of lipid peroxidation (IC50 = 5 µM) which was not mediated by the alkaloids berberine, berbamine, and oxyacanthine.